HP Serviceguard, formerly known as MC/ServiceGuard, is a high-availability cluster software produced by HP that runs on HP-UX and Linux. Refer the link for HP Serviceguard Cluster Package Configuration. Download Service guard for linux from HP Site and Install those packages from iso images using rpm -ivh. After starting the service and make entry to your path settings in your profile file to find out the Service Guard clusters command, else you need to mention the command path. All commands from service guard will be available if you typed just cm and pressing tab twice. Default location will be /usr/local/cmcluster. 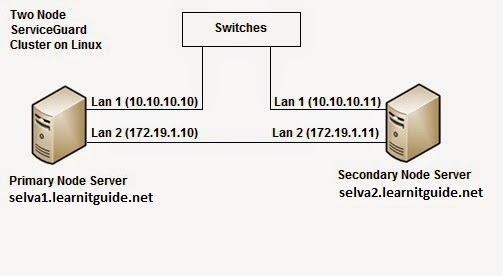 Do these above installation steps on both the nodes. Go to the default config location for Service Guard /usr/local/cmcluster/conf. available to the host selva1 and selva2. Note. 1238 corresponds to the registered "hacl-qs" service. they will restart automaticly and reread the "qs_authfile". Do the same setup in the second node selva2. Change your cluster name as you want and STATIONARY IP and HEARTBEAT IP Correctly. Check you config file for any errors, if you found any errors, try to correct it. Both the nodes should be up. If everything goes well, now you can go for creating the cluster packages for your database or application. Package Configuration will give you in next updates.